Dr. Pace is a graduate of Tufts University School of Dental Medicine. She completed her residency at Christiana Care Health Services (formerly the Wilmington Medical Center). After practicing general dentistry for ten years, she attended the University of Pennsylvania for two years to receive her specialty Certificate in Endodontics. 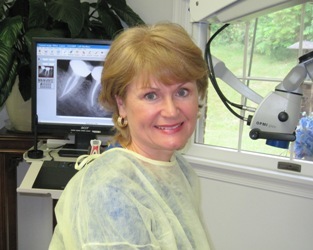 She has been practicing endodontics since 1993. Dr. Pace teaches endodontics and endodontic microsurgery to resident doctors at the Albert Einstein Medical Center in Philadelphia and Christiana Care Health Services. After providing dental care for low-income elderly patients for 25 years at the Nemours Health Clinic, she now serves as the consulting endodontist. She is a member of the American Dental Association, the American Association of Endodontists, the American Board of Endodontics, the Delaware State Dental Society, and the American Academy of Oral and Maxillofacial Radiology. She is also a member of Omicron Kappa Upsilon National Honor Dental Society. Dr. Pace has been Voted Top Dentist in Delaware Today Magazine, Readers Choice in Delaware Today Magazine, and has been listed in the Delaware Valley Consumer Checklist "Outstanding Dental Specialists". Dr. Pace has appeared on the television special American Health Front on NBC in 2007. As a member of the Prescription Drug Action Committee, Dr. Pace was asked by the News Journal to weigh in on the state's push for doctors to adhere to stricter guidelines when prescribing pain medication. The article was published in the Wilmington News Journal on May 12, 2016. You can read the full article here at http://delonline.us/1WCbXe3. Dr. Pace is board certified by the American Board of Endodontics. This board was founded in 1964 and is the only certifying board in the dental specialty of endodontics recognized by the American Dental Association and the American Association of Endodontists. The purpose of the board is to assure the public that the endodontist it certifies has demonstrated exceptional knowledge, skill, and expertise in the specialty of endodontics and to progressively raise the quality of patient care.